After unsuccessfully chasing a rare Sabine’s Gull on Duluth, Minnesota’s Park Point, I realized how big the waves on Lake Superior were. I knew that the wind had been blowing hard all night, but I hadn’t put 2 and 2 together…Until I saw the flooding in Canal Park. The parking lot by Duluth’s canal and Marine Museum was already flooded and closed off. I parked as close as I could and skirted the floodwaters behind a hotel. Sheltering in a cluster of pine trees some 100 feet from the shoreline, I started snapping photos. Every few minutes, a series of bigger waves would roll in and explode around the East Pier Breakwall Lighthouse (photo below). I had to frequently turn my back on the lake and shelter my camera from the spray. I had rubber knee-high boots on and a rain coat, but it did little to protect me when a massive wave broke out of my peripheral vision and soaked me up to my waist. This wave must have been significantly bigger than the rest since up to this point only a couple times had the water even reached me. Time to go! I headed up the North Shore for Tettegouche State Park. The huge rhyolite cliffs there are at a perfect angle for taking on the giant waves of a nor’easter storm. I called my photographer friend Paul Sundberg who intimately knows the photo opportunities on the North Shore (See his website here). It was no surprise that when he answered his cell phone I could hear the wailing wind in the background. He was already shooting the super-waves. He pointed me towards Crystal Bay on Lake Superior near Illgen City. He said the fall colors made for a unique shot since most big storms happen in late spring (no leaves yet) or during the “Gales of November” (leaves all gone). Paul is very generous with his info and I thanked him as we crossed paths at the spot. He’d already been shooting for a couple hours and was headed to find lunch. I took his spot. The highest cliffs in these photos are about 80 feet tall I believe. That puts some amazing perspective to these monster waves. I took photos with my Canon 7D and Canon 70-200mm f4 lens, while simultaneously shooting video with my Panasonic GH5 on a tripod next to me. I didn’t record good audio just because I didn’t think about it. Wish I would have. Video shot with Panasonic GH5 with Sigma 50-500mm lens at 50-200mm (depending on shot) on Benro tripod; frame rates varying from 30fps to 180fps (super slow motion). Created in iMovie. 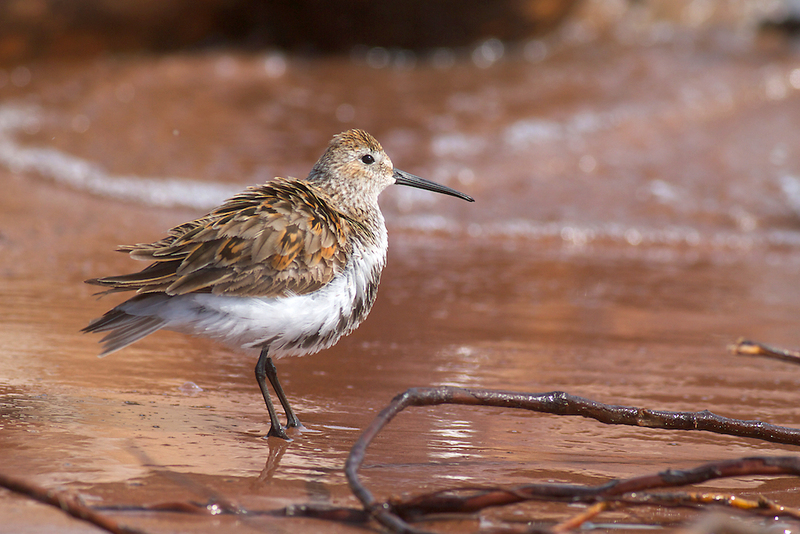 Shorebirds are some of our latest migrants in the northern reaches of Minnesota. Though flocks may begin appearing in late April, the mass movement doesn’t peak until late May. And so I took several opportunities to scope out the migration along one of Lake Superior’s most beautiful beaches…Wisconsin Point. Along with its “sister spit,” Park Point in Duluth, Minnesota, they create the world’s longest freshwater sand spit…nearly 10 miles long! 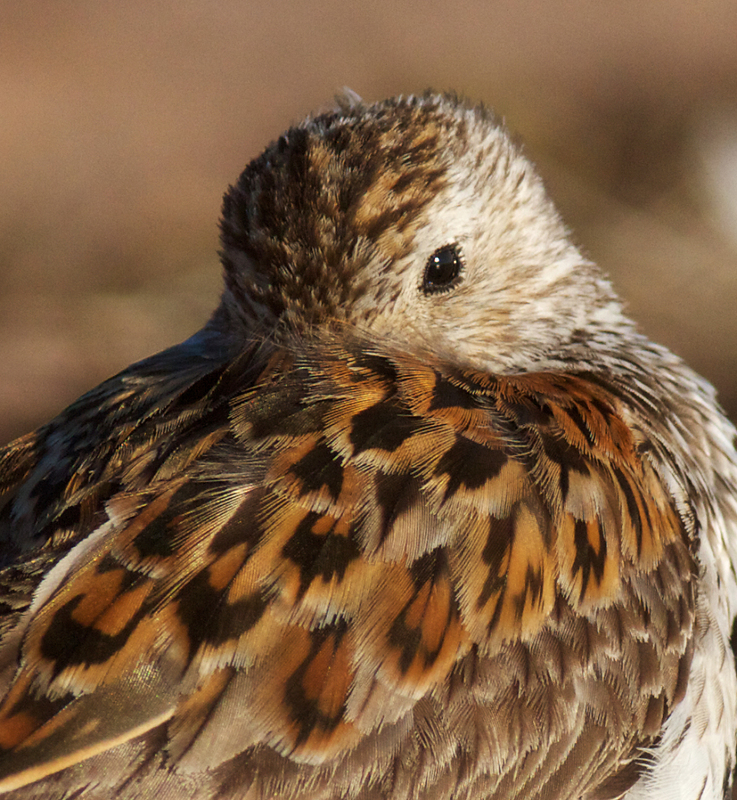 Shorebirds moving north to their Arctic breeding grounds find the wide sand beaches and immense body of water familiar sights, and are likely reminded of their coastal wintering grounds in the southern U.S., Central and South America. My technique in photographing shorebirds (shown in my video, Get Close & Get the Shot) is to move slowly in plain sight of the waders, crawling along the beach, then laying down in the sand as they get near. I try to get as close to eye level as possible (without grinding sand into my camera equipment!) as this gives a more intimate portrait. The success ration is not high as they often turn and start feeding in the opposite direction or scurry past so fast that getting a shot is almost impossible. 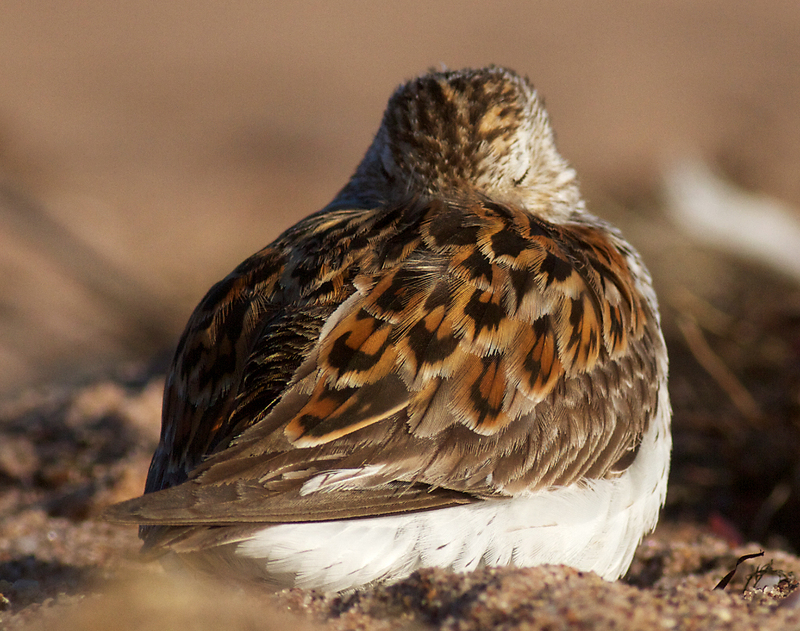 Considering that this Dunlin may have already flown a thousand miles from wintering beaches in the southeastern U.S. or Atlantic Coast, it’s no wonder she’s tuckered out. And she’s got a couple thousand more miles to go to get to breeding grounds in northern Canada and the North Slope of Alaska. Dunlin are easy to identify. They are the ones that look like their bellies have been dipped in black ink. Also note their longer drooping bill. 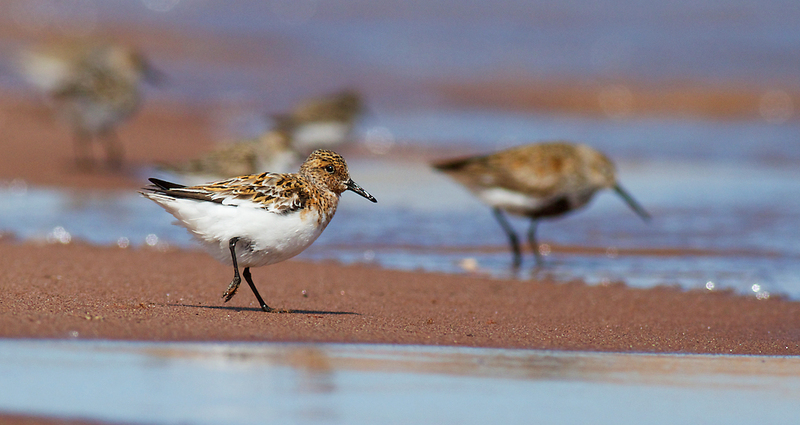 We normally see Sanderlings in their “winter whites,” their pale non-breeding plumage. But this bird is already acquiring its reddish breeding plumage. 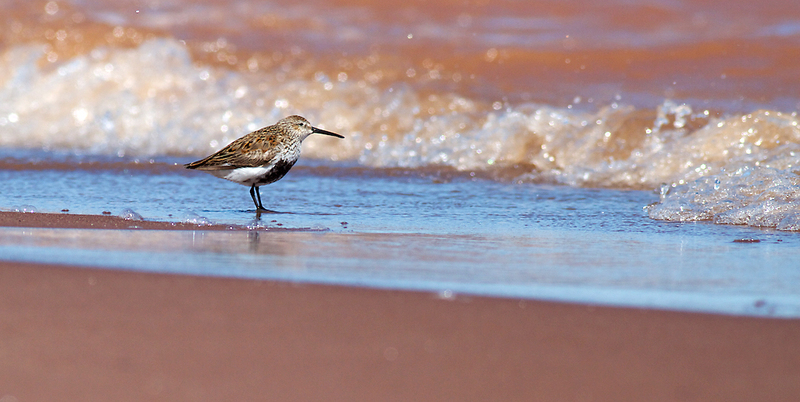 This mixed flock of shorebirds contains Sanderlings, Dunlin and a rather rare visitor to Lake Superior…the Red Knot (the largest bird). I usually only see one or two of these each spring, and some years I miss them completely, so this was a real treat. 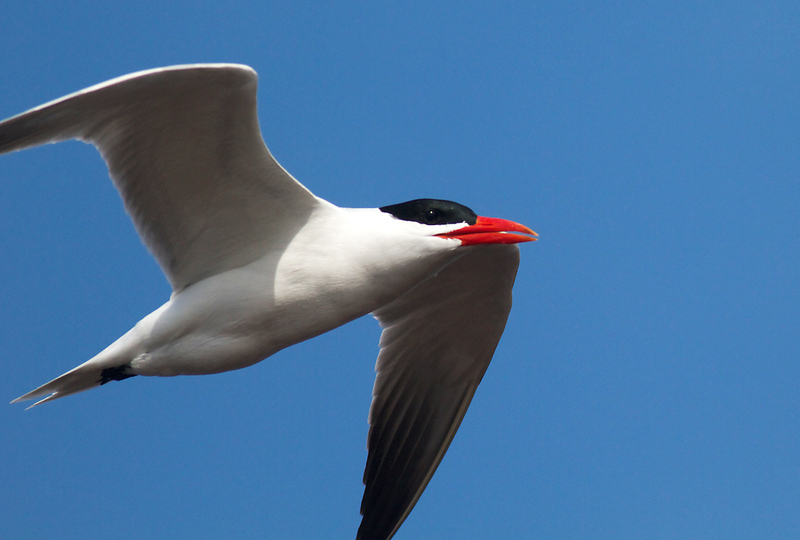 Terns seemingly float on buoyant wingbeats as they patrol shorelines for fish. Their head is angled down scanning the water for a likely meal and once a fish is spotted, they instantly tuck their wings in and go into a plummeting vertical dive into the water. 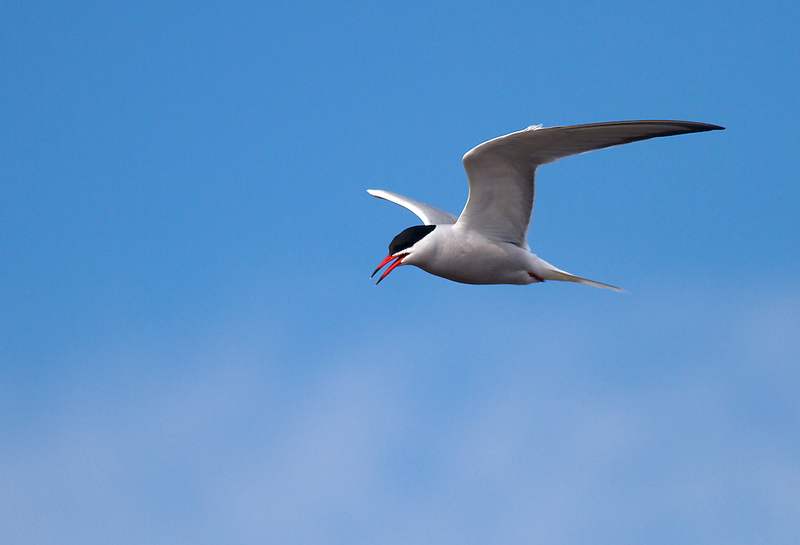 As part of their courtship the male Common Tern flies around with a small fish which he offers to the female. Strangely, these terns LOVE to nest on dredge material…sand and dirt dug up from the Duluth-Superior bay and piled on to land. Due to this preference, Common Terns formerly nested right in the Port Terminal of Duluth, which was essentially built entirely on dredge. 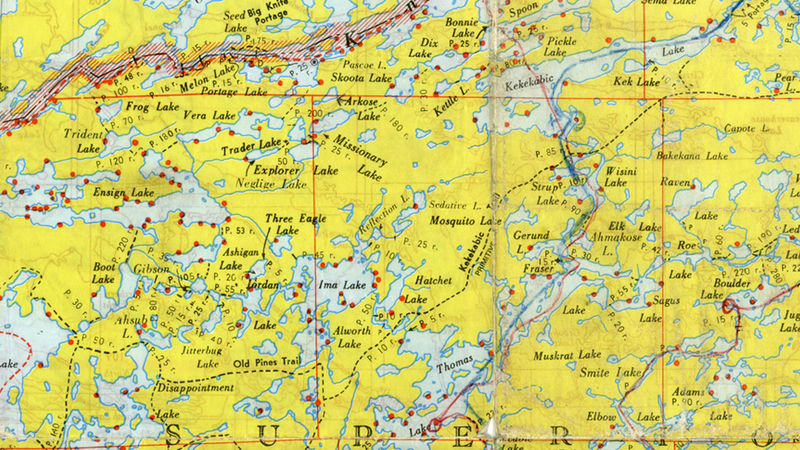 But an effort to move them out of this busy industrial area had little success until Interstate Island (a tiny 8 acre island in the St. Louis Estuary just upstream of the Blatnik Bridge which is divided by the Minnesota-Wisconsin state lines) was bulldozed and became an ideal sanctuary off limits to humans. Unfortunately, Ring-billed Gulls rule the island with 13,000 nest in a recent census. Common Tern nests numbered about 200. This is only one of two nesting locations in the Lake Superior region. 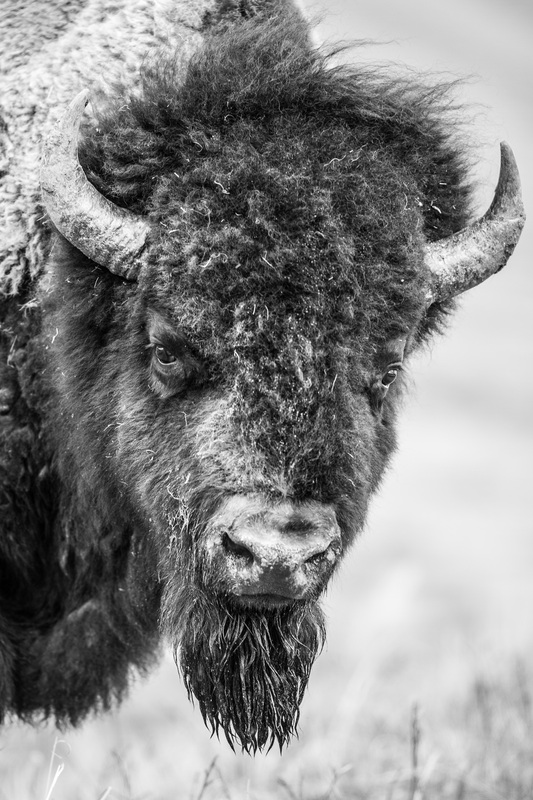 Commons are listed as Endangered in Wisconsin and Threatened in Minnesota. I LOVE Caspian Terns! 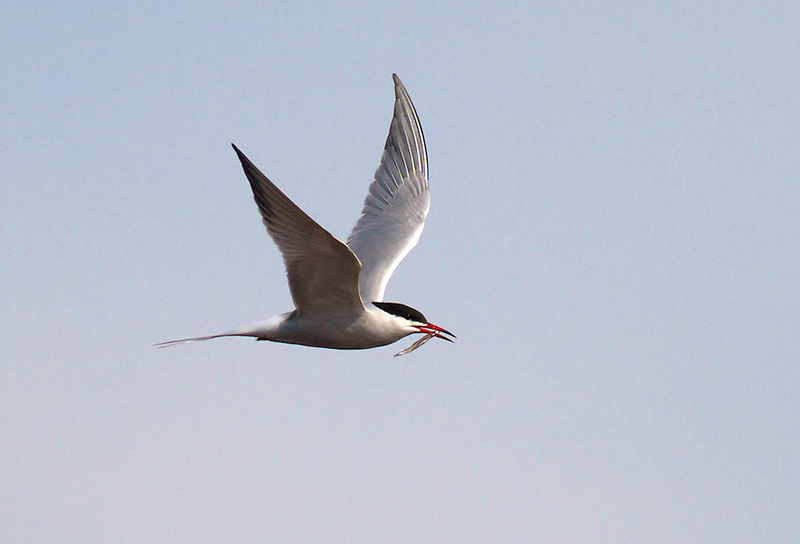 Maybe it’s that I only see them passing through in late May, or maybe their exotic name (they also range across parts of Europe and Russia including the Caspian Sea) These mega-terns are giant versions of the diminutive Commons that perched nearby. Their pterodactyl-like croak signals their presence with authority! Like the Common Terns, Caspians live almost entirely on fish. 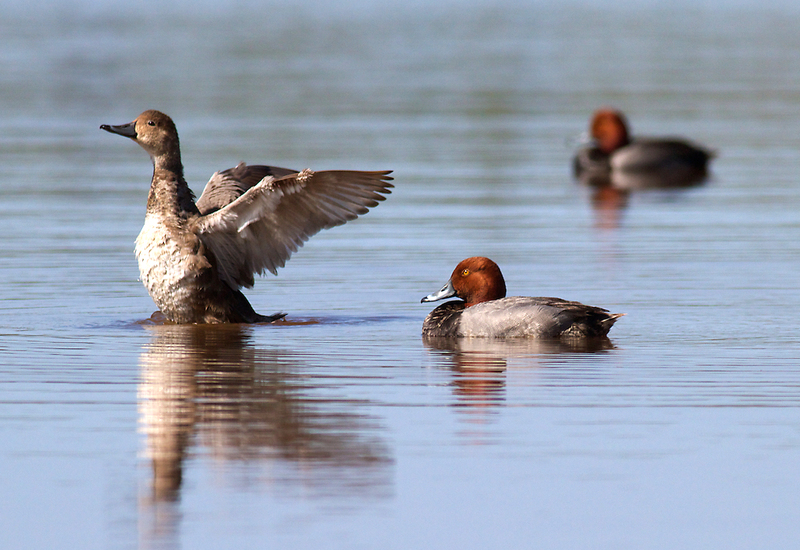 Redheads are attractive ducks of our western and midwestern pothole prairies. 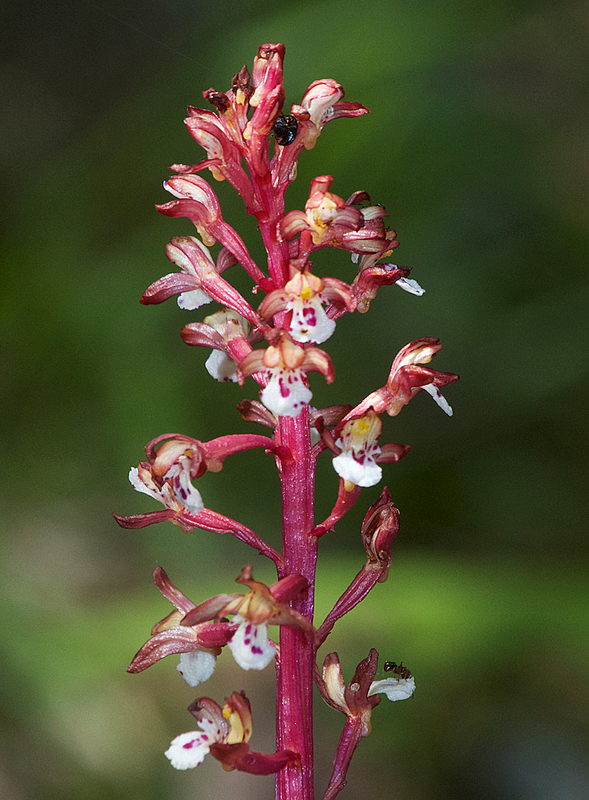 While not rare, they are certainly not common either, and always a treat to see. This flock of four was even tolerant of my semi-stealthy approach along the bank of the bay. 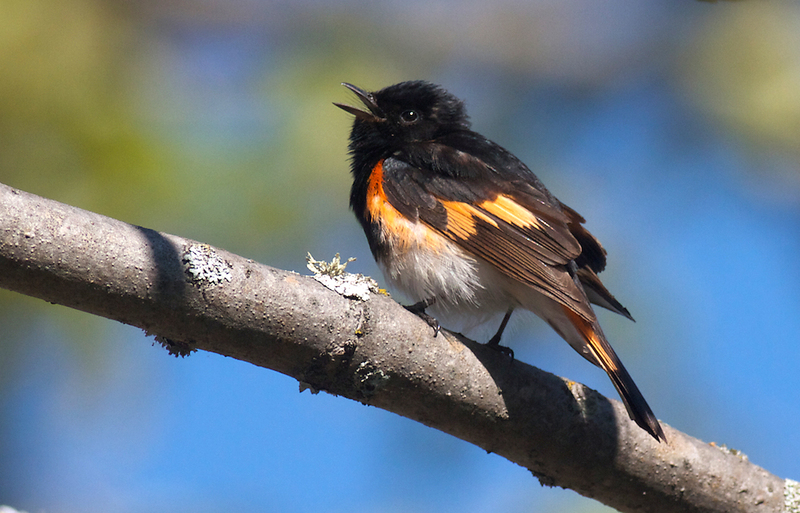 Hiking back to the car on the inland side of the wind-whipped point we found a very cooperative warbler, the American Redstart, proudly and emphatically defending his territory in song. Roseanne Cash & Sparky: Together again? Did the title of this post catch your attention? Well the title could very well have been: “PUT YOUR BEST PHOTOS AND VIDEO EVERYWHERE! BECAUSE YOU NEVER KNOW WHO MIGHT SEE IT AND CALL YOU AND WANT TO BUY IT” Maybe a little wordy, but the point is that as photographers, we should be sharing our stuff, first and foremost just to share our passion with the world, but also it doesn’t hurt if every now and then someone wants to buy something of yours! In this case, I received a call a few weeks ago from a production company in Los Angeles. They had found my short video clip of monster waves hitting the icy shore of Tettegouche State Park on Lake Superior during a March gale last year. The editors liked it and included it in the “rough cut” for their client—DiscoverAmerica, an organization promoting tourism TO the U.S. in Europe, Asia and around the World. Well, the 1-second clip survived the cuts and even made it into two TV commercials (shown below). When I opened the link to the finished product yesterday, I was thrilled with the videos…I had no idea that the whole campaign was built around a music video and original song by ROSEANNE CASH, country-pop-folk-blues-rock star and eldest daughter of Johnny Cash. Fun surprise! …and a great video. It is a 12.3 million dollar project and the “first ever global ad campaign for the United States.” The TV commercials will run in the United Kingdom, Japan, Canada, Brazil, South Korea and other countries. And the website is very fun too…see it here. No clip of mine in this short, but the outdoor adventure sport clips are fantastic! Here is the full clip shot at Tettegouche State Park on Lake Superior on March 23, 2011. So I guess the point is, that sometimes you get lucky! And to get lucky, people have to be able to find and see your stuff…and today that means the internet. To help your odds of being “discovered,” keyword your photos and give your titles/file names common sense searchable names “Waves on Lake Superior” for example (This is how they found my video on vimeo). Also use photo/video sites like photoshelter, smugmug, flickr, google plus, vimeo and youtube to place your galleries and videos. And blogs consistently rank high in searches because they are updated frequently (or should be!). My video shot with the Canon 7D and Canon 70-200 f4 lens on tripod. I really enjoy the exercise of picking my Top Ten from the previous year. As I peruse the “4-star” files, it gives me a chance to reflect on the adventures and misadventures, the misses and successes from the previous year. While the duties of being the father of a 3-year old and 1 1/2 year old has kept me close to home, I’m still fairly satisfied with the results. My point? You don’t really need to travel to Africa, Antarctica or Alaska to make stunning images. Start in your own backyard! The sunflower/raindrop shot was taken 20 feet from the front door! This is the only photo of the bunch that was taken further than 85 miles from home; This perturbed Canada Goose was defending territory on my mother-in-law’s pond in Galesburg, Illinois. The light was perfect, it is tack sharp, and there is behavior. The goose’s open beak makes the shot. 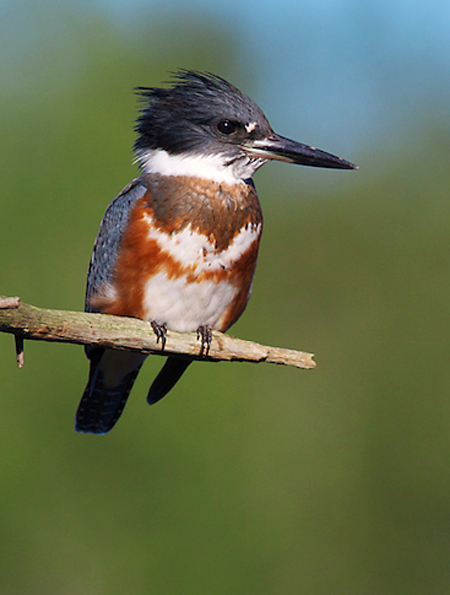 It also shows that common and familiar birds can still make great subjects. Okay, I didn’t actually click the shutter of the camera for this shot…It was taken by my Bushnell Trophy Cam trail camera. And it’s not that great of a shot…BUT, I included it because 2011 was the Year of the Trail Camera for me…And this Bobcat was only 100 feet from the house. I’ve never seen a Bobcat on our 5 acres but the trail camera has recorded them on more than a dozen nights/days. It just goes to show how many subjects may be near by but never seen. Another oddball choice, but I really like this picture. It is a HDR (High Dynamic Range) image created from 3 separate photos taken at different exposures. I’ve always loved vernacular architecture—old buildings, gas stations, city halls, school houses, barns—so this abandoned farm caught my eye as I was taking a “long cut” home through Pine and Carlton Counties. I got very wet taking this images of a Le Conte’s Sparrow in the Sax-Zim Bog 40 miles NW of Duluth. It was just after dawn and this guy was singing away, intent on attracting a female even though it was late in the breeding season. Dew covered every blade of grass and I got drenched as I made my way closer and closer to the songster in the old hay-field. Le Conte’s Sparrows are not common so I was thrilled that he let me get within 20 feet. In fact, he was still singing when I backed off and returned to my truck. A surreal landscape (icescape?) of bushes encased in a thick layer of ice on Stoney Point between Duluth and Two Harbors on Lake Superior. Taken at sunset but looking east…I much prefer the pink and blue of the eastern vista at sunset to the gaudy 🙂 oranges and reds of the west. 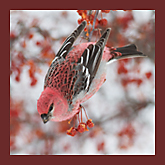 Pine Grosbeaks only visit the “tropical south” of northern Minnesota in winter. They nest in Canada. 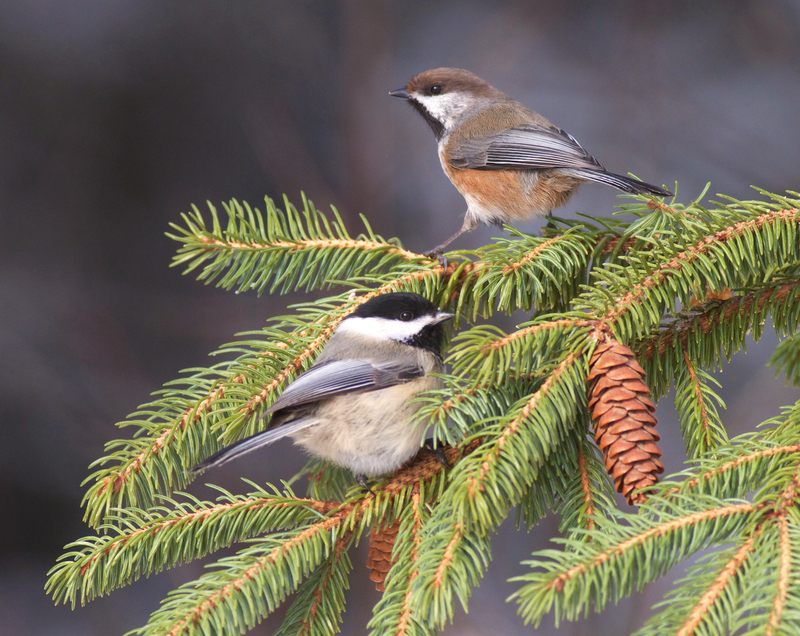 Their pinkish red feathers are stunning in the snowy woods. But this was actually taken in our local city park only five miles from home! It is possible to have flying birds and the moon in focus without resorting to Photoshop! Taken in late October at Crex Meadows, Wisconsin…a major stopover in their migration south. A very rare phenomenon…the “wavebow” was captured along the North Shore of Lake Superior in March. I just happened to be driving by and saw this scene. I pulled over and scrambled down the embankment to fire off a few shots before it disappeared. It is in the latest issue of Lake Superior Magazine as a two-page spread. Probably the photo that took the most time to get…I shot hundreds of images over a two week period to get this shot…And I finally got it right outside our front door! The time between a raindrop/dewdrop building up to critical mass and falling from the petal is milliseconds. The editors at the Minnesota Conservation Volunteer also liked it and it ran in the Nov-Dec 2011 issue. If I get motivated I may do more “Top Tens” of landscape, birds, mammals etc. But I do hope this motivates you to do your own Top Ten images. Since I’m daddy-daycare on weekday mornings, I don’t get out for sunrise shooting as much as I used to. So when I get a chance, I like to take it. Though we had a cold winter, not much ice formed on Lake Superior this year. This has more to do with the water temp going into winter and the wind over the Lake in winter, than just cold temps. But with recent northeast winds, some ice had blown in to the “Head of the Lake” which is Duluth. Huge frozen “drifts” of solid ice formed about 100 yards off Park Point. These form where open water splashes and crashes into shore ice. Some may be ten to twelve feet high. Most are crescent-shaped. On this particular morning, the chunks of ice had rounded off from jostling each other in the swells. Not quite “pancake ice,” which are perfectly rounded ice chunks. Fortunately there were clouds in the sky when I arrived well before sunrise. This may seem counterintuitive, but landscape photographers live for scattered clouds. If completely cloudy, no sun will peak through and there will be no color in the sky. Completely clear and there will also be no color in the sky…just a brief moment at sunrise when there is a chance for atmospheric color. Today the sun rose above Superior and lit up the clouds with hints of blue, purple and orange. I used a 2-stop Neutral Density filter to hold back the sky which was several stops brighter than the ice. When I got home, I discovered that I had several nice images of the sky, and several with a better composition with the foreground ice, but no single image that really popped. I decided to combine my favorite sky with my best foreground. I did this with Layers in Photoshop. Easy to do in this case with a relatively level horizon. The Eraser Tool, Levels, Curves and Saturation completed the work. Technically, this image is a photo-illustration since it is two photos combined into one. It can not be entered into competitions unless there is a category for such manipulated images. But I don’t care, as this one is just for me…and I like it!